UPDATE: Sen. Rand Paul's (R-KY) office has provided Townhall the following statement regarding last year's attack. "Before Senator Paul was violently attacked from behind, he had no conversations or discussions with the attacker. There was no 'longstanding dispute.' This description is untrue. It is impossible to have a dispute when no words of disagreement were ever spoken - neither immediately nor at any other time before the attack occurred. In the decade prior to the attack, Senator Paul had no contact with the attacker. The attack was a pre-meditated assault that broke six of the Senator’s ribs and was complicated by fluid and blood around the lung and recurrent pneumonia. Any description of this attack that implies a “yard dispute” justifies such violence and misses the point." 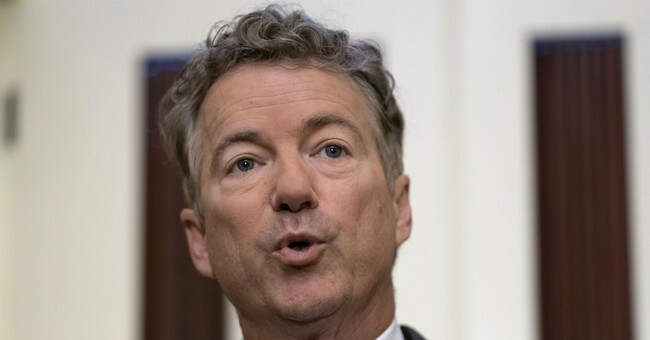 Sen. Rand Paul (R-KY) was left with six broken ribs, including three displaced fractures, and months of intense pain that felt like 1,000 knives after his neighbor attacked him last year. The assailant, Dr. Rene Boucher, attacked Paul while he was mowing his lawn. The senator had just stepped off the lawn mower and was wearing silencing earmuffs and never saw or heard his neighbor coming. It said the disagreement over yard debris dates back to September 2017, when Paul piled a 10-foot-wide (3-meter-wide) stack of limbs onto a spot near Boucher’s property. The pile sat until October, when Boucher picked it up and hauled it away in portable dumpsters. “Even though this debris was not on Dr. Boucher’s property, he viewed it as unsightly — as it was placed directly in his line of sight from his patio and the back door of his house,” the court record said. The next day, Paul used his lawnmower to blow leaves onto Boucher’s yard and then made another branch pile in the same spot, it said. “As Dr. Boucher has stated throughout, he lost his temper and tackled Rand Paul as Paul was carrying branches from another location on his property and placing them on the property line,” the memorandum said. Boucher, formally requested to be placed on probation in court on Friday. Special Prosecutor Bradley Shepard had his own request: a 21-month prison sentence. Sentencing is this Friday.